Data Matrix (2D) barcodes are being adopted very quickly in a wide range of industries for their compact size and data capacity. Generate Data Matrix barcodes directly from NAV that include all information relevant to a scan, such as an item number, lot number, expiration date, UOM, or even quantity. The smaller barcode size means it can be applied to smaller items, or made large enough to be scanned from a distance while still fitting on a small label. The number of distinct pieces of data stored in the barcode can reduce the number of scans required to execute an action. For example, a single scan could bring in an item number, lot number, and weight. 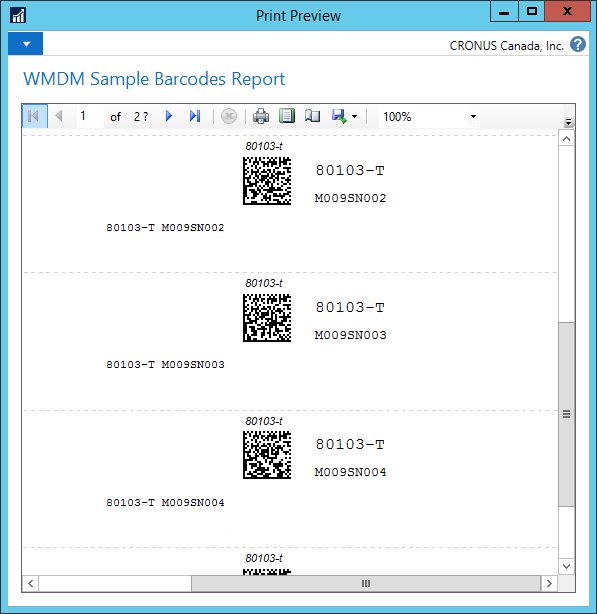 In addition to Data Matrix codes, flexible user-configured rules enable the system to interpret any barcode format and symbology you can imagine, including UPC/GS1, GTIN, custom formats, etc.